Eastern screech owl (Megascops asio) is known to be a master of disguise. The nocturnal owl blends well colorwise into its gray background in these parts. It is even hard to find when sleeping upright and pressed against a tree log opening. Its hidability is also aided by its color patterns that involve complex bands and spots to provide excellent camouflage against tree bark. In fact, this owl species is far more often heard than seen with its vibrating trilling sound. The short, stocky bird has a large head and almost no neck. The tree-friendly bird is roughly the size of a pint glass and enjoys a wide range of food from earthworms, insects and lizards to mice, squirrels and rabbits to small birds and woodpeckers to bats and, more rarely, other owls. 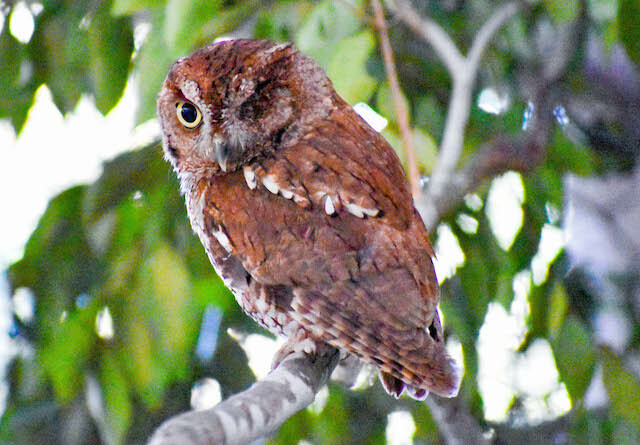 Eastern screech owls can store extra food in tree holes for as long as four days. If you’d like an Eastern screech owl to take up residence in your backyard’s natural setting, attach a nest box to a nearby tree. The structure should have a sloped roof, recessed floor and drainage floors in the floor of the box and proper ventilation holes in the walls. 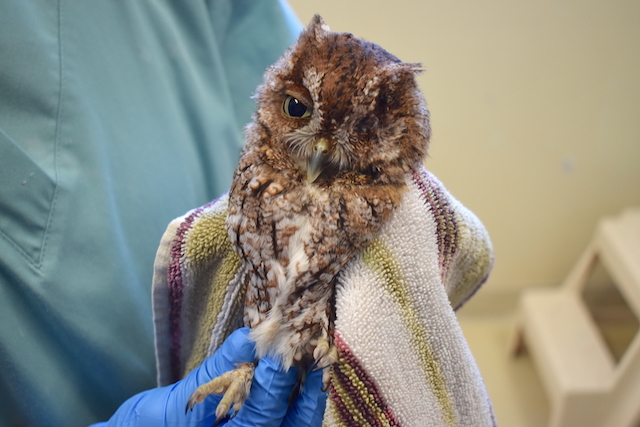 At CROW, an adult Eastern screech owl was admitted from Labelle, when it was found along the side of the road. It was suspected to have been struck by a vehicle. As a result of the trauma, the owl suffered severe damage to its left eye. Just a couple days after being admitted, the eye showed no signs of improvement, and veterinarians involved with the case made the decision to remove or eviscerate the damaged eye. “The luxation, or dislocation, of the lens meant that the eye could not be repaired,” said Dr. Kyle Abbott, CROW veterinary intern. “The surgery was performed because this would be a source of chronic pain for this patient.” Since the surgery, the patient has reportedly been doing well. It was stated to have a great appetite and was recently moved to an outside enclosure where rehab staff is assessing its flight and hunting abilities before determining if it will be released. UPDATE: This patient was released on January 14.